The documentation and concept book of the project Corpora in Si(gh)te, held between October 2007 and January 2008 at the Yamaguchi Center for Arts and Media (YCAM) announces an unprecedentedly styled architectural exhibition. The book includes explanation drawings, comments and concept texts by the members of doubleNegatives Architecture (the authors of the project) and texts by curators. Yamaguchi Center for Arts and Media (YCAM) holds a new installation”Corpora in Si(gh)te” (commissioned by YCAM) by “doubleNegatives Architecture.” doubleNegatives Architecture is an architectural group, engaged in crossover activities in a new area of architecture, making good use of various media and information technologies. In “Corpora in Si(gh)te” a number of sensors are setup forming a mesh network throughout the area of YCAM in order to collect and distribute realtime environmental information such as temperature, brightness, humidity, wind direction and sound. The data collected from these sources are processed by a software and translated into nodes reflecting the sensor network. These nodes are the seeds for the virtual architecture of “Corpora” representing a cellular, distributed network of nodes that are reacting through realtime processing, growing and subsiding like an organism. Each node makes local decisions independently of a central architect. The nodes inadvertently give rise to an architectural structure, both in the YCAM building and in the park. This “information architecture” of nodes has its own spatial perception to make itself transform into various forms by relying on the super-eye concept. The fluid character of this architecture occurs as a living form. Visitors can observe this process by Augmented Reality Technology, located in various parts of YCAM. The concept book available for purchase in printed form from Amazon Japan. 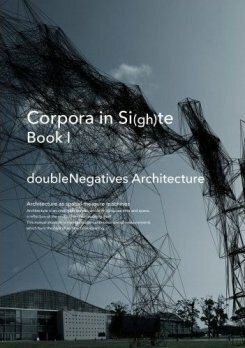 Our concept book, a collection of concepts about Corpora, is available for download under the CC-nc-by-sa license from our site in PDF format here.